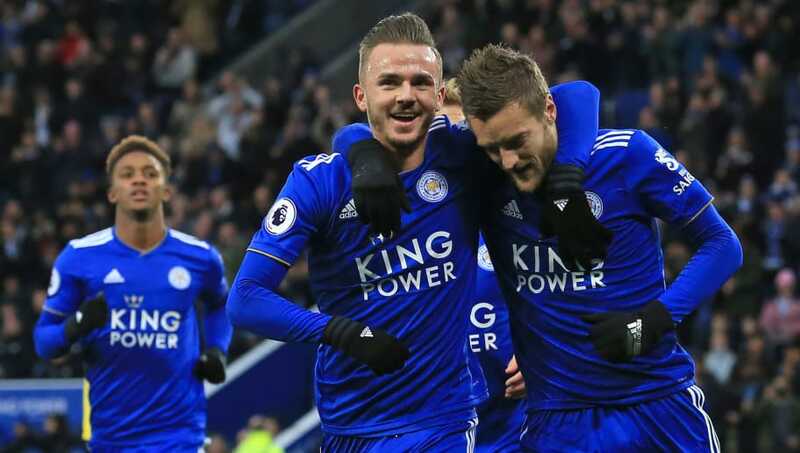 Leicester triumphed over an error ridden Watford side on Saturday as goals from Jamie Vardy and James Maddison secured a comfortable victory at the King Power Stadium. A costly error inside the first ten minutes put this fixture beyond the Hornets before they could get up to pace. Leicester saw out the game in fairly easy fashion, thanks to a wasteful Watford side that were far too vulnerable on the counter. It's been a rollercoaster ride for Watford this season and this one began on a downswing. Jamie Vardy had been causing problems for the Watford backline from the get-go with his pace and soon enough Ben Foster brought him down in the box. Vardy converted from the spot last week for Leicester against Brighton and he was on hand again to hand the Foxes an early lead. James Maddison increased the deficit with a spectacular finish just ten minutes later, juggling the ball through the Watford backline before volleying beyond Foster. Leicester were understandably buzzing after a perfect start in the first 20 minutes but may count themselves lucky they got the job done when they did. It was relatively comfortable for the Foxes as Watford really struggled to create anything that would trouble Schmeichel. A little complacency began to creep into the side though and they were second best for the majority of the game. Watford have played some positive football this season but Foxes fans won't have expected to be chasing ghosts at home against one of their immediate rivals. The Foxes ended with less than 37% of the play, soaking up pressure from the Hornets and offering little more than a sporadic counter attack. Those goals were their only two shots on target. It was enough to get the job done but that was more to do with Watford's misfiring front line than Leicester's resolute defence. Starting XI: Schmeichel (6); Pereira (7), Morgan (6), Evans (6), Chilwell (7); Mendy (6), Ndidi (6); Gray (7), Maddison (8), Albrighton (6); Vardy (7). Substitutes: Soyuncu (6), Iheanacho (6). STAR MAN - James Maddison promised he'd make up for his red card against Brighton in his last game and he didn't disappoint. A few eyebrows were raised over his sizeable price tag in the summer but he has proven an excellent addition to Leicester's squad. His goal came at a crucial time, calming the game down and allowing his side to take control. Watford never managed to recover and it was a wonderful piece of attacking play to boot. WORST PLAYER - Leicester weren't really tested on Saturday but there was still room for improvement, notably in midfield. As the game got away from them, fingers must be pointed towards Wilfred Ndidi and Nampalys Mendy. They did little to impose themselves on the game and left far too much space to exploit between them and the backline. Javi Gracia is the tenth Watford boss to have worked under the Pozzo family but became the first of those to earn a contract extension this week after an impressive start. The football's nice but there may be a little style over substance about Watford's approach and that will only get worse as teams figure them out. Aiyawatt Srivaddhanaprabha has put on free food and drink for Watford fans. He wanted to say thanks for their banner hailing his dad Vichai after his death. It's the stronger teams that have exposed their underbelly so far, having now conceded 14 goals in just six fixtures against top ten sides. It made them perfect picking for Leicester's pacy counter attacking style, with the Hornets guilty of overcommitting to attack. They're just too easy to score against, which is threatening to derail their impressive start to the season and, given the Pozzo's managerial record, could make a mockery of Gracia's extension. Starting XI: Foster (5); Holebas (8), Cathcart (6), Mariappa (7) Femenia (6); Capoue (5), Doucoure (6); Pereyra (7), Hughes (6), Success (5); Deulofeu (5). Substitutes: Deeney (6), Gray (5), Chalobah (6). STAR MAN - Despite Watford's flair and panache it was full back Jose Holebas who provided their best attacking outlet. As much as anything that was the biggest failure for the Hornets today, as they couldn't offer a cutting edge in the final third. Holebas got back well too but couldn't do much about either of the goals, with Leicester largely targeting the two centre halves who they could easily beat for pace. WORST PLAYER - The Watford centre halves were troubled by Vardy early in the game but Ben Foster didn't have to come so far off his line. Once he did, he had to make the challenge, with Vardy's pace carrying him comfortably beyond the advancing keeper. All the advantage is with the attacker in that situation and Foster was unsurprisingly unable to make a clean contact. He'll perhaps put it down to an early panic but it handed the opposition an early foothold in the game that proved insurmountable for Watford. Leicester take on their former boss Claudio Ranieri and his struggling Fulham side up next before a tough clash with Tottenham. Watford face the seemingly impossible task of overcoming Pep Guardiola's Manchester City before a clash with a former boss of their own when they travel to Marco Silva's Everton the following week.